Displaying personal photos and mementos adds warmth to your home and gives it a unique personality. Choose from Sophisticated Black, or the warm look of Natural Blonde Beech Wood, Hickory Brown, Teak Wood. 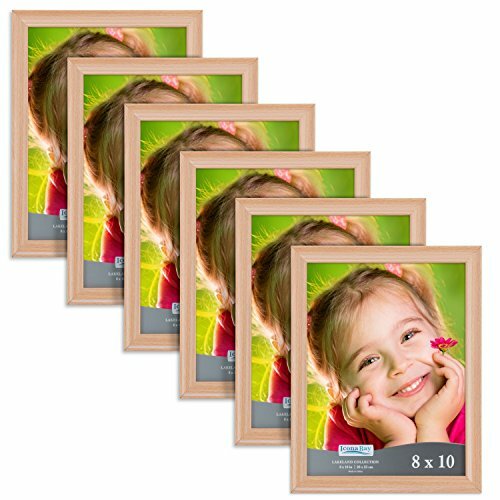 Constructed of high-quality MDF with realistic wood veneer, these frames have the look and feel of real wood but are more durable and stand up better to changes in temperature and humidity. The Icona Bay Lakeland Collection includes 4x6 and 5x7 snapshot sizes, 8x10 and 11x14 frames for larger photos, portraits, or artwork, Icona Bay collages, and Document or Diploma frames. Frames include a movable hook for wall mounting, either horizontally or vertically. Frames also have an adjustable kickstand fin on the back, so they can be set on a tabletop, desk, or shelf. Get mixed sizes to create a photo gallery grouping in a hallway or along a staircase. Or, set frames on a photo ledge, accent table, or piano top. You can also add awards and certificates, souvenirs such as ticket stubs, programs, and postcards, children's artwork, and anything that has meaning to you. A set of Lakeland Collection frames by Icona Bay is a thoughtful gift for any occasion.